anand_palm wrote: You havent answered to my question on why penrose choose the forumla to represent palms alone but not fingers. I don't know his motivation. Maybe it was because he was a mathematician. The formula works with the fingers because of the equality. Every loop has a triradius. Arch 0, Loop 1, Whorl 2. You would be adding the same number on each side of the equation T + 1 = D + L. One more triradius, one more loop. I think you misunderstood the purpose of Penrose's rule: it only describes how the various dermatoglyphic elements (loops & triradii) relate to the number of fingers. And contrary to Patti's earlier suggestion (and also contrary to my earlier response), Penrose's rule ALWAYS works for malformed hands and feet, and it can be applied to the individual palms, soles... and the individual fingers and toes! "Each of the triradii (except the essential ones, normally 4 per limb, on palms and soles) is accompagnied by a loop or tented arch." So, there is no extra-value to include the 10 fingerprints to the palms as well, because the fingers should by principle always be assessed as an phenomenon on its own - and contrary to the fingers... the palm is a much more complicated phenomenon to be assessed completely! So you can even apply Penrose's rule to an individual finger or toe: by applying for the number of digits the number 1 into Penrose's formula for the digit-element D...! (It probably requires further reading to understand the fundamental importance of Penrose's topological formula). It appears that Mr. Mukherjee (in your link) chose to add the tented arch and a pattern on the fingerprint with 3 triradii in order to make the formula work in all cases. Thanks for sharing those materials from Penrose's 1971 article. I think it's especially interesting that Penrose adresses the issue of 'extralimital triradii'... which should explain how Penrose would approach your earlier example with 1 palmar loop featured by only 4 palmar triradii (unfortunately, in the symbolic representation of the original hand we can only guess how the ridges under the ring finger are aligned... maybe the presence of a large white region could indicate the presence of a triradius that somehow was not noticed by the observer???). And yes, everything should be considered in the right perspective.... and elements from different perspectives should not get 'mixed' - unless explicit described! Patti, I think it is quite obvious that Penrose's comments about the tented arch in the perspective of the issue of 'pattern intensity' should not be confused with the issue of the 'topological formula'. And by the way... did you notice how Mukherjee is directly refering to Penrose's work from 1965 regarding the issue of how a palmar tented arch should be counted likewise as a palmar loop? "... (although this is now in regards to intensity)"
I don't think there is any space left for disagreement regarding how to apply Penrose's topological forumula, because all necessary elements are described in the Penrose article that you introduced + the Mukherjee article that I introduced. I hope this now makes sense for you as well? I did not say the formula didn't make sense. I went in search of samples that didn't fit the description and found them. I understand your doubts about the print with a missing triradius under the ring finger. I would have liked to see an actual inkprint. The tented arch does not fit the rules for topology as seen in these illustrations. The whole theory rests on the loops being formed in the fields between the radiants and not flowing over the top of an aborted main line or radiant. In this last illustration, fig 2.5, the closest to a tented arch would be the + 3 in the upper left corner. But that would imply that there are two more loops - not seen. 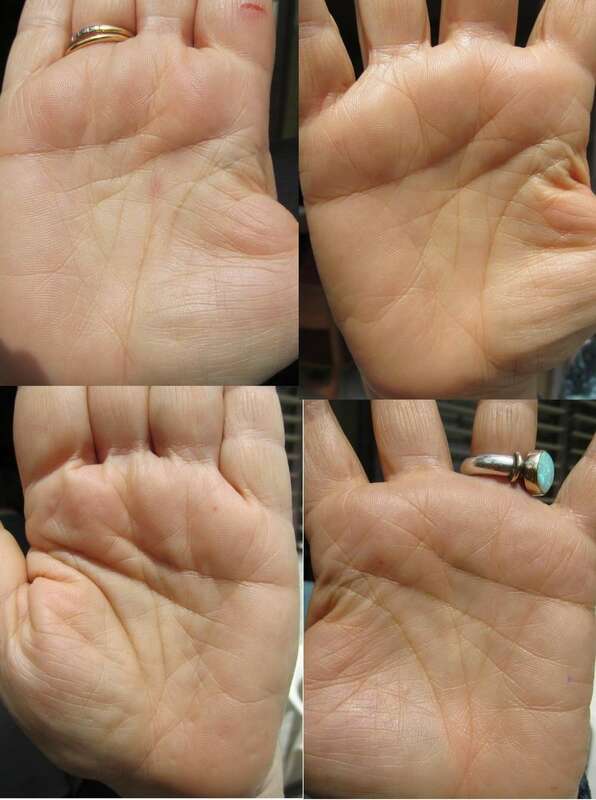 Patti, instead of the +3 example.... my choice would be that the -1 example comes much more close to the 'tented arch' from a visual perspective: the upper example for a fingerprint and the lower example for the palm. (But I have not read the text). Regarding the +3 example I have the associaton with unusual fingerprints that are featured with 3 triradii (for example a fingerprint featured with a whorl + a loop). And the 0 refers to an arch, 1 refers to a loop, 2 refers to a whorl (comparable with double loop), etc. I considered the same one as you ( -1 ), but the other rules get in the way. A triradius is formed in a 'valley' and a loop is formed on a 'hill'. Also apparently there is an opposite flow of ridges involved in forming a loop as compared to a triradius. Well... at least you can see how complicated it is just to form a single loop or a triradius. The twins obviously have mathematically complex features! Sorry Patti, I don't understand how the rules get in the way. By the way, the geometric principles in figure 2.18 show how a triradius is formed at an irregular slope located BETWEEN the hill (e.g top of the volar pad) and the valley. And by the way, did you notice how in figure 2.5 the shapes of +3, +2 and +1 sort of fit into the shapes of 0 and -1? This shows how one can combine these elements in order to construct the combination of elements that are seen in a real fingerprint. Yes the loop and triradius cancel each other out when counting loops and triradii. But, I think this particular feature is an exception to their formula and basic topological rules, and a person must add justifications and explanations to make it fit. Perhaps Penrose covered this and we just haven't found the direct literature source yet. This is all about math and nothing is mentioned of the observation that the ridges develop from radial to ulnar in the palms. This would have to influence the initial direction of the flow of ridges starting with the index finger's triradius.
" L - T = 2 + B - C This is illustrated in Fig. 2.5, where the presence of cusps disturbs the L - T relationship in the enclosed areas. As can be seen from the examples, the presence of an inward cusp (B) increases the L - T value by one, the presence of an outward cusp (C) decreases by one. " Loesch points out that it's curious that humans do not have a quadradius. I find it interesting when you study the interdigal loops with the accessory triradii, you will notice that combined they represent 4 fields under one digit!! Looking at the raja loop or loop between index and middle fingers, you can see one shared field is the loop, another is the field below the loop. Then each triradius has a separate non-shared field of its own, making for 4 fields shared between two triradii.